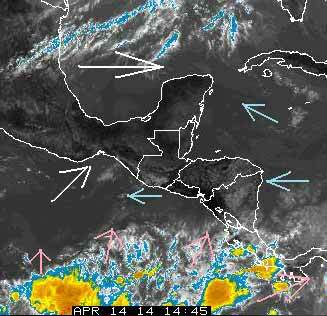 Belize NMS: Fair and mostly dry weather conditions exist. 24-hour forecast: Mostly sunny skies today and partly cloudy skies tonight. Showers will be isolated. Today: Winds: E/SE 10-20 kt. Seas: Moderate. Waves: 3-5 ft. Isolated showers. Tomorrow: Winds: E/SE 5-15 kt. Seas: Choppy. Waves: 2-4 ft. Isolated showers. Marine Outlook: (Tuesday night) Winds: East 5-15 kt. Seas: Choppy. Waves: 2-4ft. Isolated showers. General Outlook: Mostly fair and dry conditions until Tues. afternoon and night when a slight increase in showers and thunderstorms occur over inland areas. The wind is blowing from the ESE at 15 mph and effecting the diving possibilities this morning. The expected high is 89 and the sea is rough. No rain anywhere for 400 km . . . Probably very similar to yesterday. No significant weather activity in our area. . ..Caribbean Low winds at surface ( Blue ) High level winds ( White ) as usual from the West and SW. . .. . But there is an out-swelling of ITCZ cloud ( Pink ) , moving out in all directions and towards Belize. . . . . . .Which may bring a change tomorrow.